We left the Roswell Trailer Village RV Park at our usual leisurely hour of 11 AM and headed into the north part of town to restock supplies and fill up on diesel and generator gas. As we had built up a bag of donation clothing and other items, we took the opportunity to drop that off at a conveniently located Goodwill along the way. Remember the ABC rule? Always Be Clearing Out and “one in, one out.” We bought a couple of clothing items in our continuing effort to fill in some wardrobe gaps, but we left far more than we took. Heading towards the mountains and our half way stopping point in route to Petrified Forest. Don’t let the picture fool you; it was mostly up hill. 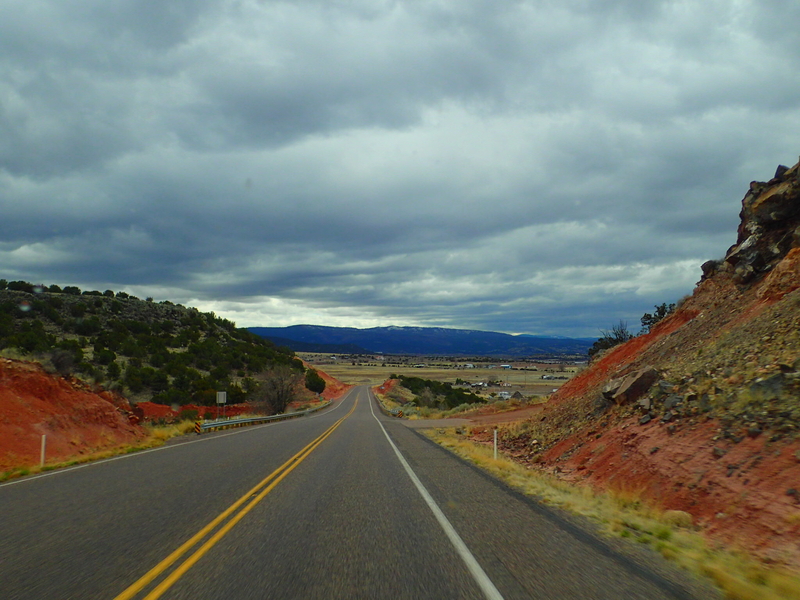 We were headed towards the Petrified Forest National Park across the Arizona border to the northwest, but since that entailed a 384 mile journey through several mountain ranges, far more than I like to do in one day, we researched options for a half way, one night stopping point. 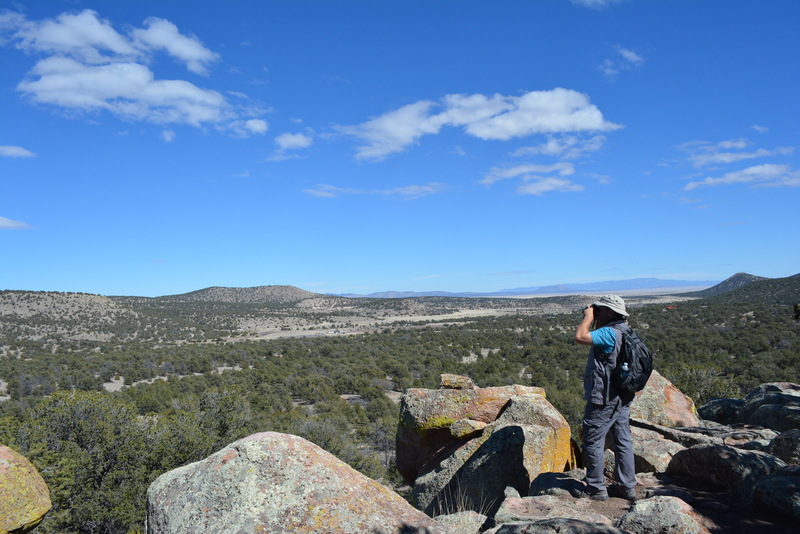 I looked for possible spots in the Cibola National Forest before remembering that Wheeling It spends a lot of time in this section of the country and always manages to find great low-cost or free spots. A quick check of their site revealed a jaunt along our exact route with a stay over at Datil Well, a Bureau of Land Management campground just a bit further along our route than I had planned, but at $5 a night and with a solid review from an established and experienced full-time RV blogger, we had to take it. Due to our late departure from Roswell, we were unable to completely follow in Wheeling It’s tracks by stopping at the Very Large Array along the way, but we nodded sagely at it as we passed. 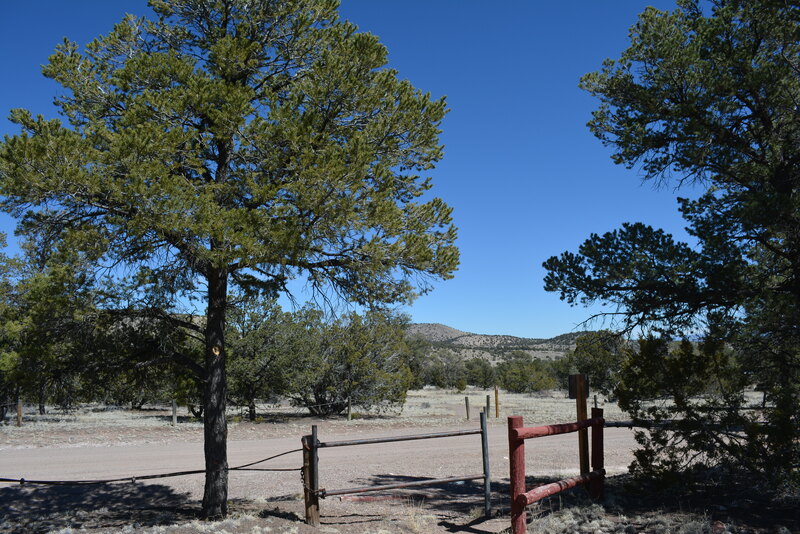 Datil Well is half a mile up a firm packed dirt road just off highway 60 a mile or so north of the small town of Datil, NM. Shortly before we arrived an SUV pulling one of those cute, retro-styled, tear drop-shaped Tab trailers passed us on the highway, and as we pulled into Datil Well we spotted them setting up camp. 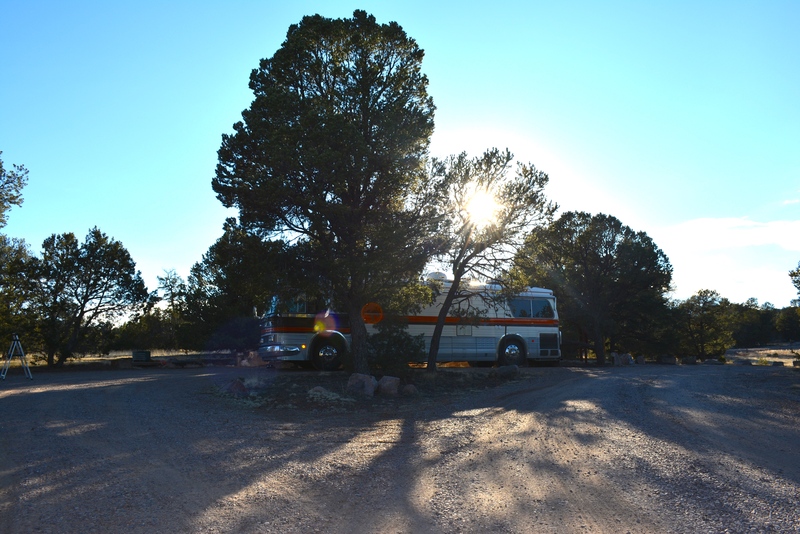 We were the only two rigs in this campground with 25 sites. We picked one of the larger, mostly level spots, #8, made payment via the honor system envelope at the front of the camp, and settled in for what we thought would be a one night stay. There are no hook ups at all, just a nice site in a beautiful, juniper dominated mountain forest. The campground has clean pit toilets, and each site has a table, fire ring, and grill. After getting our little Honda generator going, we met the Tab trailer owners, Craig and Mary from Iowa, who were kind enough to give us a tour of their remarkable little trailer. We reciprocated and ended up trading stories and jokes for an hour or two in the Big Kahuna. After a near freezing night we slept in to our usual hour, finally rousing ourselves with full intention of breaking camp and heading towards the next adventure. But damn! This place looked so beautiful, and we had it all to ourselves! 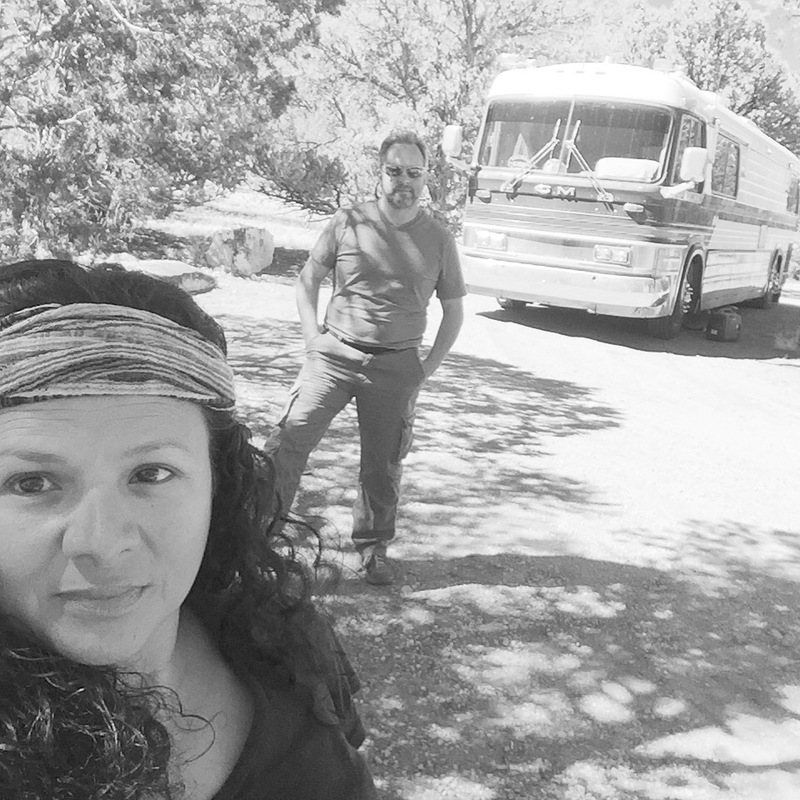 Which brings us to one of the greatest advantages of full-time RVing: you can change the plan any time you want. So we did. I mean, really now: we had only been in this marvelous campground for 17 hours, we had not gotten to explore any of the hiking trails, and the Petrified Forest, after 225 million years, had firmly demonstrated that it wasn’t going anywhere. We did not hunt or gather this food at Datil Well. But it was delicious. So we settled back, cooked a brunch, prepped our day pack, and took a 3.3 mile hike along the mountain trails and beautiful, 6800 foot elevation overlooks. As evening approached we got a fire going in the pit, roasted hot dogs, and hit the hay early so we could defy our usual pattern and get down the road earlier than our typical, nearly noon start time. ← Crash landing in Roswell, and our first RVillage encounter (finally!). Let us know when your new album comes out, and we will buy it!!! 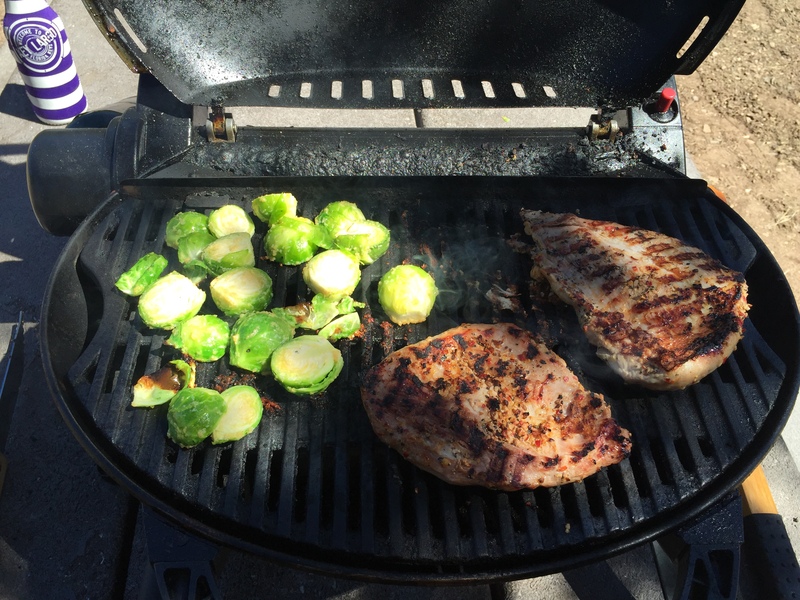 By the way, are those brussel sprouts on that grill……yum! You got it. Of course we have to actually produce it. Might have to write some music too. Oh, and learn how to play instruments and sing. What a GREAT blog and a GRAND adventure! Thanks Mary, wish we could have spent more time with you and Craig. I guess when we convert from neo-funk folk to blue grass Craig will be the first we call, heh.